We are supplier and distributor of Inkjet Engraver. Our product range also comprises of Inkjet Printing Machine & Solution, Inkjet Printer Spare Part and Inkjet Printer Ink & Cartridge. We are engaged in offering Inkjet Printer Engraver (Computer to Screen Printing). This is also known as Computer to Screen Imaging System. To develop serious cost-reduction plans and implement productivity enhancements, these systems increase digital-imaging speeds and reduce investment costs that is the core reason for traditional screen printing businesses, in order to minimize the inevitable confrontation with digital printing. The systems offered by us maximize the efficiency in pre-press and production, as these are manufactured to offer complete solution for screen printers. The SS PROTON system can increase pre-press productivity in many segments of the industry. SS-PROTON is fast, precise, cost-effective and easy to use, as compared to traditional, film-based work-flow, which has complicated process from the creation of the artwork till the screen is ready to print. We are engaged in offering Inkjet Engraver for Screen Printing. These systems increase digital-imaging speeds and reduce investment costs that is the core reason for traditional screen printing businesses, The systems offered by us maximize the efficiency in prepress and production, which has complicated process from the creation of the artwork till the screen is ready to print. 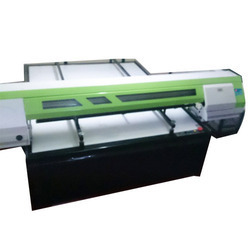 We are engaged in offering UV LASER (Blu-Ray)Screen Engraver (Computer to Screen Printing). This is also known as Computer to Screen Imaging System. To develop serious cost-reduction plans and implement productivity enhancements, these systems increase digital-imaging speeds and reduce investment costs that is the core reason for traditional screen printing businesses, in order to minimize the inevitable confrontation with digital printing. The systems offered by us maximize the efficiency in pre-press and production, as these are manufactured to offer complete solution for screen printers. The SS PROTON system can increase pre-press productivity in many segments of the industry. SS-PROTON is fast, precise, cost-effective and easy to use, as compared to traditional, film-based work-flow, which has complicated process from the creation of the artwork till the screen is ready to print. Use of Semi Conductor Laser Diodes having a long lifetime . Contant Temeprature control system for precise luminence and prolonged diode life . Option to use 8-32 Nos. of Laser Diodes . Reduces the process steps in design exposing, thereby increasing precision and productivity. This is a Screen Printing Machine. 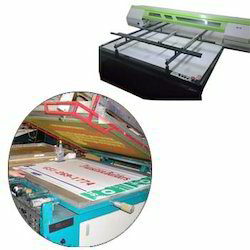 These Flat Screen Printing Machines are extensively used for printing on flat surfaces, Procured from trusted manufacturers of the market, the machines we offer are widely used for printing on varied flat surface including paper, plastic, PVC and metal, Furthermore, a wider space is provided to enable easier paper loading.